Over four hundred thousand Australians volunteered to serve in the armed forces during the First World War. In recent years all of these records have been digitised and are freely available to researchers. However, aside from the men’s names, there is no breakdown by state or service. By identifying over three hundred South Australians who served as airmen during the conflict, this book represents an invaluable resource that would otherwise take an enormous amount of effort to compile. The key to this research is Adelaide-based author and historian Chas Schaedel. For decades, Chas’s passion has been Australian airmen who served in the Great War. In 1972 Chas published the highly acclaimed Men & Machines of the Australian Flying Corps 1914–1919. In those days Chas was able to meet or corresponded with many of the airmen veterans. In this way, Chas and his research form a living link to the airmen of that period. 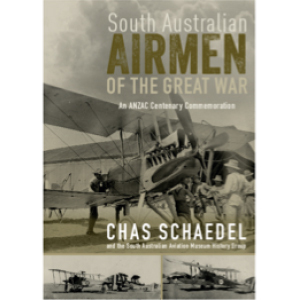 The South Australian Aviation Museum is proud to be associated with Chas and collaborate with him to produce this unique Anzac Centenary project publication. The scope of entries is wide and varied. A few individuals had aviation experience pre-dating the war. Others enlisted and trained in the final year of the war for what was expected to be a longer conflict. A number became famed flying ‘aces’, including Edgar McCloughry – the highest-scoring South Australian with twenty-one victories. Post-war, a number of these men were able to use their training and experiences for pioneering feats. Most famously, the brothers Ross and Keith Smith made the first flight from England to Australia in 1919. Others had outstanding careers, including Sir Richard Williams, a founding father of the Royal Australian Air Force, and polar-explorer Sir Hubert Wilkins, who was so highly regarded by the United States Navy that his ashes were scattered at the North Pole by a nuclear submarine. Finally, some thirty South Australian airmen have been identified as having given their lives during their service. A dozen are not listed on the North Terrace War Memorial and this research may present a case for their inclusion.